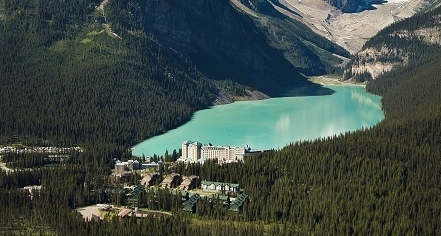 Just below the majestic Victoria Glacier sits the epic Fairmont Chateau Lake Louise. As part of Alberta’s Banff National Park and a UNESCO World Heritage Site, the Fairmont Chateau Lake Louise is globally recognized for its progressive environmental stewardship and responsibility. The hotel had humble beginnings as a base for outdoor enthusiasts over 100 years ago, and has become the most well-known year-round mountain resort in Canada. With over 36,000 square feet of event space, this picturesque wedding venue also features world class hospitality, 552 guestrooms over eight floors, and includes seven restaurants, bars, and lounges. Modern amenities like Le Labo toiletries, luxurious bedding, plush bathrobes, and slippers in recently renovated suites provide guests with all the comforts of home and the opulence of days gone by. The Spa at Fairmont Chateau Lake Louise leaves guests feeling pampered, relaxed, and rejuvenated, especially after an afternoon class of Pilates or yoga. Fairmont Chateau Lake Louise is a year-round outdoor enthusiast’s mecca. Step into a real-life snow globe in the winter and experience all the most iconic Canadian winter activities right from the resort’s doorstep, including snowshoeing, cross-country skiing, ice skating, sleigh rides, dog sledding, and ice climbing. World-class skiing can be enjoyed at the second largest ski resort in Canada, which is a short, 10-minute drive from the hotel. In summer, Lake Louise transforms into a hiker’s paradise, with kilometers of trails accessible from the lakefront. Enjoy some of the most spectacular views in the Canadian Rockies from one of the scenic hiking trails or paddle across the turquoise blue lake while soaking in the vistas. The resort offers guided mountain adventure experiences year-round for guests seeking to discover the area’s hidden gems and learn all about Banff National Park. Fairmont Chateau Lake Louise offers guests a true resort experience with the finest in accommodations and amenities, unsurpassed service, and endless activity. Fairmont Chateau Lake Louise, a member of Historic Hotels Worldwide since 2018, dates back to 1911. Fairmont Chateau Lake Louise has been repeatedly named on the prestigious Conde Nast Traveler “Gold List” for hospitality excellence. Hotel/Resort Fees & Taxes: There is a daily service fee of $15.00 CAD (plus 5% tax, 2% Tourism Improvement Fee, 4% Alberta Tourism Levy), per room, per night. 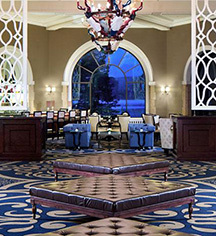 The service fee includes all Bellmen and Valet gratuities as well as the following services: complimentary WiFi, complimentary fitness classes, free local and 1-800 calls, 24-hour Business Center access, ski valet, Lake Louise village and Ski Resort shuttle. Parking: On-site parking is available (surcharge). Pet Policy: $50.00 CAD, per accommodation. Two pets per room. Smoking Policy: Smoking is allowed in designated areas. Just below the majestic Victoria Glacier sits the epic Fairmont Chateau Lake Louise. As part of Alberta’s Banff National Park and a UNESCO World Heritage Site, the Fairmont Chateau Lake Louise is globally recognized for its progressive environmental stewardship and responsibility. Learn more about the History of Fairmont Chateau Lake Louise .